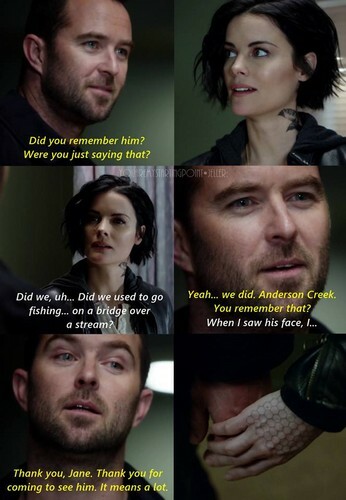 Our love for Blindspot has survived this long hellatus hiatus, but we have to admit, we’re very anxious for it to return to our screens, we miss so much our favorite show and specially Jeller AKA that OTP that drives us crazy. Because, honestly, despite driving us crazy, they’re one of the best couples ever and we’ve put together a list of ABCs that reminds us why we love Jeller with all our heart. Here we go! The search for answers was part of what has always pushed Jeller to work together, first they wanted answers about the tattoos, which introduced Jane to the FBI, the team and Kurt and later, they needed answers about Shepherd’s plans and that brought back Jane very close to Kurt. In addition, the answers that Jane has always sought about her past and about a possible Roman redemption, brought them together even more. One of the most important scenes for this couple occurs after the breakup between Jane and Oliver. They’ve broken because Oliver felt that both had a lot of baggage and he wasn’t ready for a relationship like that. Zapata then tells Jane a big truth: when you really love someone, when you find the right person, the baggage doesn’t matter and the camera was responsible for showing us the “right person” for Jane: Kurt Weller. A small, subtle…but tremendously significant scene. What happened with the CIA, who kidnapped Jane and tortured her for months, was a turning point in the Jeller relationship. She blamed Kurt for leaving her in their hands and she felt betrayed and disappointed. When he learned what happened, apart from making it clear to Jane that he had nothing to do with it, he confronted the agency and even took care of the man who tortured Jane so brutally, and when the circumstances forced them to work together, Kurt always kept the distance and made palpable the contempt he felt towards that man, causing Jane’s disappointment and her sense of betrayal to evaporate. In “Resolves Eleven Myths” (2×07) Jane shows the conflict between the person she wants to be, the perfect life she wants and that part of her that thinks she doesn’t deserve any of that. In that dream Kurt appears as her partner, her boyfriend, showing that Jane’s most intimate desire is to have a happy and quiet life with Kurt, that no one else exists for her. Is there anything prettier than this? Jane and Kurt are everything to each other and are able to do anything for the other. For example, Kurt helped Roman and made many concessions with him, for Jane, because she believed that there was something that could be saved of her brother, that there was something good. This he does for her. It’s a very deep connection that means that if one loses to the other, in a way, they lose a part of themselves, although they don’t even realize it. Jeller is life!. Some parts of Jane’s past are revealed through memories or flashbacks. These are key for the Jeller relationship, because Jane lets Kurt know a little of what she remembers of her past but, at the same time, those same memories lead her to make wrong decisions that will later significantly mark her relationship with Kurt. At first, Kurt refused to give any kind of weapon to Jane, he still didn’t know her, she seemed vulnerable, fragile, confused, scared…but Jane saved his life and that was an important moment in their relationship. Kurt was then able to see that Jane knew how to defend herself, which in addition to adding another mystery about who she was, also made him realize that she was the opposite of a damsel in distress, she was a strong badass woman. He realized that he could trust her in the field…she was his equal inside and outside the field. Hope is the last thing that is lost, it’s that ray of light to which you clutch when everything around you is darkness. Jane and Kurt have always had hope for each other. They were in the middle of a war, lost, but they always had the other to be there, they were each other’s hope, hope that everything would get better, hope that they would learn from their own mistakes, hope that they would get a new opportunity. Kurt himself explained to Jane that he had always built walls around him and she slipped inside them, which was the best and the worst for him. She’s inside him, in his heart, in his skin, she’s a part of him and there’s something very powerful in that, because that person becomes your greatest strength and support but also the only one that can really hurt and break you. Jane didn’t say it so clearly, but it’s the same thing, Kurt is part of her, he’s the only one that can break her heart. What would a TV couple be without some jealousy? Jeller has not been the exception on this issue, especially in the last season. We had already seen some jealousy when people were getting too close to Jane, but in Season 2 we saw both quite jealous. Jane couldn’t help herself and she felt jealous, even though she tried to hide it as much as possible, when Ally was close to Kurt’s life, pregnant with his son, and then jealousy increased as Nas and Kurt started dating. Kurt, meanwhile, also felt jealous when Jane started dating Oliver, it was impossible not to see how upset and jealous he was. He also tried to disguise but with much less success than Jane. In fact , I believed that at any moment his control would evaporate. Jeller know each other perfectly. They don’t need to talk, they understand with a look, a smile, a hug…they have an intuition about how the other feels and know what they feel without saying it aloud, which can be something very valuable because neither one of them are willing to talk about their feelings. But when they do, oh when they do! They’re even more adorable. Between them there’s magic. It’s undeniable that between Kurt and Jane there’s a great love, a love that is forever. Their connection was born when they met and step by step they have been growing together, discovering their feelings for each other and overcoming tough obstacles that put the love between them to test, and, although they have been distanced many times, they never stopped loving each other. They belong together, proof of it are those looks between them, that’s something that never changes. Kurt, even if he isn’t on good terms with Jane, never stops looking at her with love,and the same thing happens with her.. The missions are a very important part of the Jeller relationship, in the field is where they both realized the rapport between them, the good team they make, and it also was where Jane felt that she belonged somewhere for the first time in her life and where Kurt realized that Jane fit with the team in a natural way Through the missions Kurt learned Jane was strong and fierce, which contrasted with the fragility that she presented at first., Each mission brought them closer together. “Nice necklace”. “Thanks, someone special gave it to me.” A beautiful scene we will never forget, right? Just as it’s impossible to forget the moment when Kurt gives that necklace to Jane, a necklace that belonged to Taylor’s mother, on her birthday. One of the most epic scenes for this couple. He was Jane’s boyfriend for a short time, so it may be strange to add him to the article, but I think he was important for Jeller. Oliver was Jane’s attempt to have a normal life, to move forward with her life, just as Kurt was doing. This situation makes him begin to face his feelings and accept that he still loves Jane, in spite of everything that had happened between them. Phase two is key to this couple, everything between them seemed lost, both had real reasons to be angry, problems unresolved…but there was one thing that reunited them, and it was Phase two of Shepherd’s plan. It was urgent to find out what it was and prevent it from happening, that goal could only be achieved by working together. In addition, it’s in the middle of Phase Two when Kurt, gravely injured, gets carried away and finally tells Jane what he feels. Jeller is a healthy and quality relationship: they have matured, grown and learned from their mistakes together. Both have been able to work towards a common goal in spite of their differences and to forgive each other,little by little. they have always been there for each other, for what the other needed and they always found a foothold, a guide and a trusted person in the other. One of the reasons we love them so much!. We can’t forget Rich Dotcom, the captain of Jeller’s ship,who is the first to say aloud what everyone saw, which in turn made them analyze their own feelings in a deeper way and maybe even face them. Also, when things between Kurt and Jane were very complicated and their relationship almost nonexistent…there was Rich to give hope, to us and Jane, putting into words the feelings that Kurt was desperate to hide. We have to thank Shepherd for bringing Jane and Kurt together, she made sure that Kurt’s name was tattooed on Jane’s back and therefore she would be taken to him, since she had a specific plan for both . But also, when everything seemed to be finished and lost between them, it was the common goal of catching Shepherd and her organization, which made them work together. Good job, girl!. Something that is clear about Jeller is that there’s trust, and that comes from the first moment. Despite the misgivings of the other members of the team, Kurt fully relies on Jane and Jane does the same, she doesn’t know anybody, not even who she is…but in the midst of all that confusion; she feels that she can trust Kurt and does. Later, the circumstances and actions of both test that trust, so much, that both lose it in the other and have to fight to recover it. It’s a tough fight but it’s worth it, both learn essential lessons and that trust comes back stronger than ever. THAT scene, THAT kiss is special, Jane only wants a moment for the two of them, where the world doesn’t exist, where it’s only the two of them, being lost in each other. Jane, aside from knowing the hard side of Kurt, has also managed to get to his vulnerable side, overturning those self-imposed barriers. Jane is the first person Kurt really opens up and tells his fears, his problems and also his hopes and dreams. In Jane, Kurt has found his soulmate. In Jane’s case the same thing holds true, Kurt has witnessed her most vulnerable moments, he has always been a point of support, the person to trust, the rock to hold onto when she was confused or simply needed to vent. He’s, quite simply, the love of her life. War is something that unites Jeller, the war they wage against Sherperd gives them the opportunity to reunite and to rebuild lost confidence, rediscovering themselves. Throughout their journey, they have been fighting together on the same side of a vital war. And not only physical war is important in their relationship, but also the emotional one. Kurt has always struggled to put walls in his heart, Jane slipped inside and he had to fight with that fact, later had to fight to try to get her out of there when he felt betrayed by her and finally he had to fight against himself and his feelings for a long time before accepting that Jane had a permanent place in his heart. Jane, on the other hand, also fought her own fight to let Kurt into her life and then to accept that he apparently despised her and didn’t want to have anything to do with her, only to end up fighting with herself to risk letting him into her heart again, despite the danger. Jeller’s kisses and hugs can’t be more wonderful, it’s impossible to choose between them because each one has its own language and tells a different story. But in all of them there is a common denominator: the most sincere and pure love and that unique form to get carried away, because they feel they have found the right person. The scene at the yacht is one of the most marvelous for this couple. In it, Kurt and Jane are at a crossroads and someone must sacrifice and go on a yacht with an unflattering destination, he decides it will be he that goes, but Jane stops him telling him that he has something to live for and if she dies, no one would miss her. Later, Kurt lets her know that he would miss her. This moment is so precious, because at the beginning, when Jane offers to ride on that yacht we can see what she believes about herself: she’s alone and she has lost everything, even Kurt, but when it all ends, it’s Kurt who makes her to know that even if they aren’t in very good terms, he’s still there, caring for her, wanting her, loving her…despite everything that has happened, that hasn’t changed. It’s impossible to forget one of the scenes where the connection between them was palpable, the sparks lit a blazing fire that could be seen for miles with just a touch…an iconic scene. What do you think? Would you add some more points or use other words? Tell us your opinion in the comments below! Blindspot returns on Friday, Oct. 27 at 8/7c (NBC).